I became a vegetarian when I was 12 years old. On our annual trip to Eastern Washington, my 6th grade best friend and I made a pact. After one more hot dog, we were cutting out meat. Cold turkey. She lasted one week. I lasted 13 years. I have fallen off the vegetarian band wagon every once in awhile. I had a few years where I ate fish. Two years where I even dabbled in chicken on a random occasion. When I started my vegetarian adventure, I was a pre-teen. This means my diet consisted mainly of hot and spicy cheez-its (holy god, they’re addicting), saltine crackers and apples. It was going well for me. Although my food choices weren’t the healthiest, I knew that I would never put another piece of pork or beef in my body. At the ripe old age of 13, I discovered Meet your Meat. Say what you will about education via shock and gore, this movie changed me. As an impressionable young thing who jumped into vegetarianism on a whim, seeing where meat came from was shocking. Knowing that was where the majority of our meat came from, I wanted no part of it. And now here I am, 25 years old and I eat a mainly vegan (once in awhile an egg from Vital Farms isn’t going to hurt me), whole foods diet. Stepping away from cheese was big deterrent from vegan-ism, but as a person that eats nutritional yeast by the spoon full, I get by. In a country where obesity and heart disease are on the rise, I am kind to my body. I partake in morning runs and long sessions of stretching. I spend hours in the kitchen making nice with kale and sweet potato enchiladas. I have a happy stomach that enjoys endless amounts of fruits and vegetables. Tomorrow is national Food Day. A call for us to shake it up, change our relationship with our meal. It’s a call for us to look at our current system, our current policies, and see that this isn’t sustainable. We can’t live in a country where childhood obesity is the norm and the food that is most readily available is packed so full of sugar and preservatives there isn’t anything “food” about it. I don’t eat animals. That is my part of being a conscious eater. 13 years strong and I don’t see myself eating meat anytime soon. I get that this strict diet isn’t for everyone, but if you are at all curious, give it a try. You may be surprised at just how wonderful your body feels. There is something so satisfying about a giant plate of pasta smothered in pesto. I was so sad when I thought about losing that from my diet. Silly me, just take out the Parmesan add some nutritional yeast and you’re set. This recipe is from Vegan Spoonful, just another wonderful vegan blog for my to get inspiration. This pesto is good for pasta, for smearing on some bread or you can freeze it for later. So garlicky, so good. Combine all the ingredients in a food processor until creamy and perfect. Commence devouring at unladylike speeds. On my bike ride home the other day I saw a firefly. For me, a baby of the pacific northwest, this was a reason to squeal. Instead, I simply smiled and sent out a silent blessing to the warm evening, my bare, bug-bitten legs and the fact that it is mid October and I was wearing shorts. Man oh man people, I am so overwhelmingly happy. When I get this joyful- like I’m going to bubble over-I want to create in the kitchen. Crafting recipes and working with food is my idea of perfection. 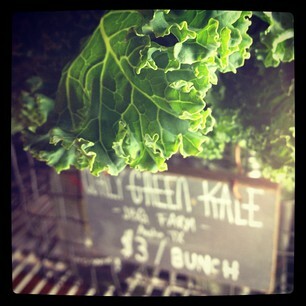 Having only two days off this month, I plan on spending them in my garden, at the farmer’s market and in the kitchen. I have visions of vegan walnut banana muffins, cinnamon granola and shiitake udon soup. Yesterday at work my daily recipe for the store was a tilapia dish with an arugula salad. The whole vegan(ish) thing left the tilapia out of my evening meal plan, but I can never turn down fresh, local arugula. 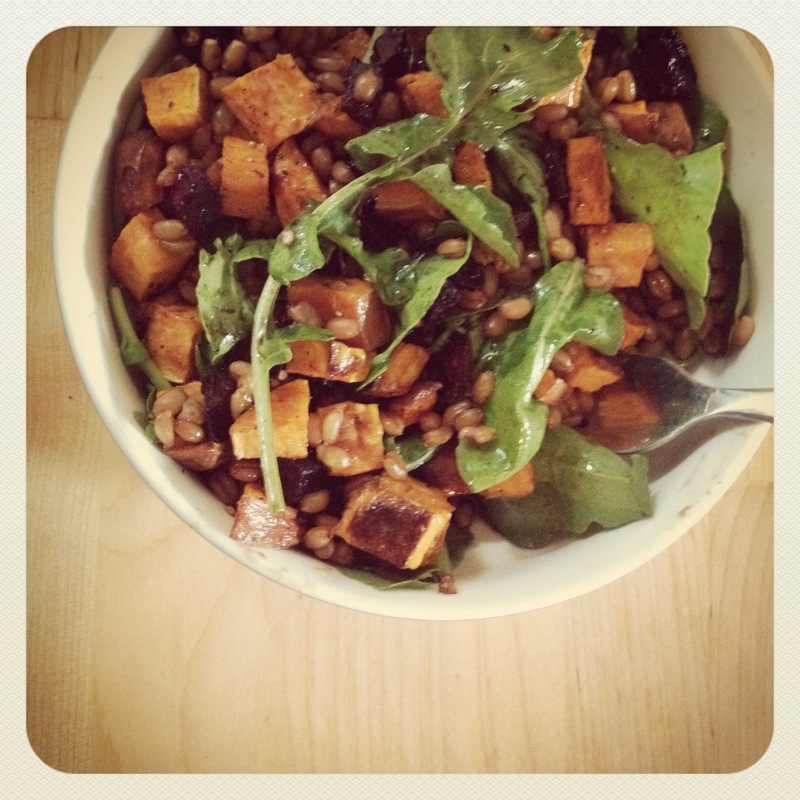 Walking through the store I got inspired by the beets and decided to do a fall wheat berry salad. The day before yesterday I found my bliss in fireflies. Yesterday it was wheat berries and sipping whiskey in a dark bar with a boy I fancy. Seek it out, and I guarantee it will be there. You will first want to start your wheat berries. To make this process faster, soak them overnight. I didn’t do this, and I knew it was going to take forever to cook them. Put the wheat berries in a pot over low/medium heat and cook. Forever. It really only took a little over an hour, but that is basically an eternity when you are hungry. Pre-heat the oven to 400 degrees and chop up your sweet potatoes and beets. I did balsamic roasted beets because it appears I wanted vinegar in every single dish… Also, because it is so freaking delicious. To make the balsamic roasted beets, toss them with 2 tbsp olive oil and 2-3 tbsp of vinegar and sprinkle with salt and pepper. I did the sweet potatoes and beets on different trays because I wasn’t sure how balsamic roasted sweet potatoes would taste. Do whatever tickles your fancy. I tossed the sweet potatoes in the remaining 1 tbsp of olive oil and also sprinkled with salt and pepper. You will want to let these cook for about 40-45 minutes, stirring occasionally. While all of those things are cooking, wash your arugula and set aside. The next step is to make the dressing, which means you mix the 1/4 cup oil with the less than 1/4 cup vinegar, pop in the chopped garlic and salt and pepper and call it good. This will make more than you need for the dish, but who doesn’t love left over salad dressing? Once everything is done roasting and cooking, mix the vegetables with the wheat berries and let cool. Then, toss in some salad dressing (to taste) and spoon over the arugula. Tastes like fall in a bowl. The only fall that I have ever known is the one filled with honeycrisp apples the size of my head and my family’s annual trip to the pumpkin patch. It is the fall that is filled with blue rain boots and roasted pumpkin seeds. It is the gathering of friends over new soup recipes and pulling out my overly baggy sweaters. That is the fall I know. Yesterday I found myself in shorts and a tank top. Swerving through the flat streets of Austin on my red bicycle. Trying to keep up with a boy who makes biking look like a cake walk. It felt like summer. Warm air and the sound of crickets. Firemen playing catch outside the station. This is the fall I will get used to. Until I do find my rhythm with this Texas season, I will make soup. I will sit in front of the air conditioner with my baggy sweater. I will pretend the leaves are changing and that somewhere in this big old state there is a pumpkin patch with my name on it. Heat 1 tbsp oil in a cast iron over medium heat. When oil is hot add 1 garlic clove. Stir until the garlic starts to turn brown and add spinach to the pot. Toss to coat and season with salt and pepper. Cook the spinach until it has just wilted but is still bright green, about two to three minutes. Remove the garlic and spinach and set aside. The magazine recommends wiping out the pan. I did no such thing. Woops. Heat the remaining olive oil (I used less than 2 tbsp… there were still remnants, and it cut down on the fat content of the dish). When oil is hot add remaining garlic and the red pepper. Add the cumin and the chipotle, cook for 1-2 minutes. Add the chickpeas and tomatoes; stir to coat and let cook for about 10 minutes, until the chickpeas start to brown. Add 3 cups of broth and bring to a simmer. Reduce heat to medium and simmer for 20 minutes. Occasionally mash a chickpea or two to show it who’s boss, and to make the mixture a stew like consistency. After the 20 minutes, fold in the spinach and simmer for another 10 minutes. If it is too thick, add more broth 1/4 cup at a time. I didn’t do this, as I like my stew to be REALLY thick. Just a matter of preference. Spoon all of this goodness into a bowl and cook your eggs. I just used the remaining oil that was in the cast iron, and cooked for medium low heat, covering the eggs with a little bit of water to cook evenly. I like my eggs sunny side up with a runny yolk, but do whatever floats your boat. The olive oil makes the edges nice and crispy, which is delicious with the stew. Yum. 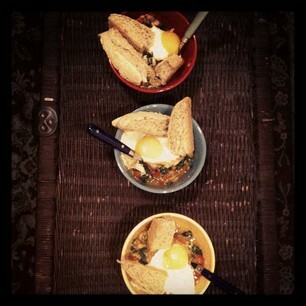 Serve the stew in bright bowls and top with an egg. * I made some homemade wheat bread with this recipe because every stew needs hearty bread. If you have the 2 hours that it takes to make bread, go for it. We may or may not have eaten two loaves in two days… Homemade bread is just that delicious.